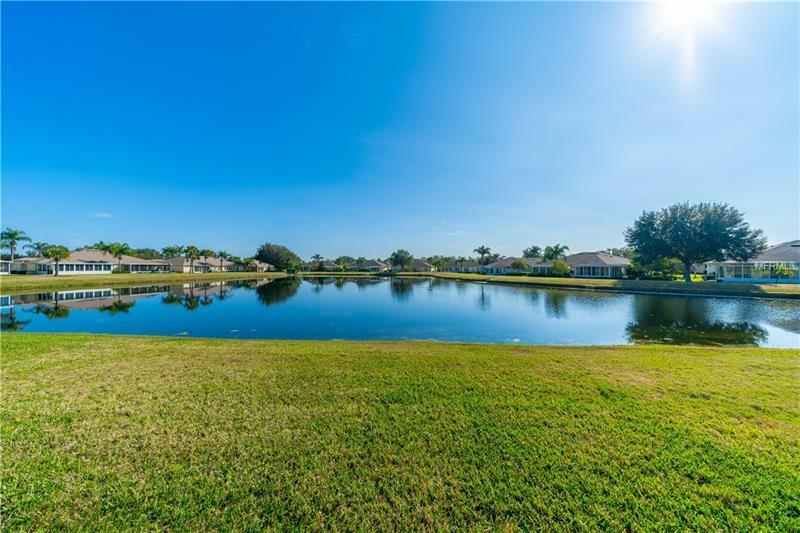 Step into this upgraded and well maintained home, and the first thing you will notice is the stunning view of the pond. Look a little closer, and you will notice engineered bamboo flooring in the living room, dining room, and bedrooms, with tile in all of the wet areas. There’s a custom made pantry with pullout drawers in the kitchen, custom made stained glass windows in the living room, granite counter tops in the kitchen and bathrooms, new light fixtures and faucets in the bathrooms, water softener, cupboards and a sink in the laundry, a large medicine cabinet and solar tube in the master bath, and upgraded light fixtures in the living room and dining room. The beautiful lanai has been expanded both out as well as to the side for approximately 300 sq ft of additional living space! Everything matches! Come live the dream in the premier 55+ gated community of Kings Point in Sun City Center. Here you will find 2 magnificent clubhouses which offer heated indoor and outdoor pools, fitness centers, game rooms, computer labs and over 200 activities and clubs. Sun City Center is within easy driving distance of Sarasota, St. Petersburg, and Tampa, featuring professional sporting events, the arts, and award winning beaches, and the wonderful world of Disney is only 90 minutes away!